I have two young kids who attend school in New York City. While nearby city streets are generally safe there have been several recent incidents of mugging and robbery of kids (without adults) on their way home from school -- dangerous and frightening incidents for youngsters. To help avoid crime and reduce risk and fear, Kids should be prepared to avoid or reduce risks of crime against them and how to react . This includes ways to minimize chances of being chosen for a target as well as ways to avoid problems if they are approached. This preparedness could even include some simple self-defense and escape tactics. Here is some advice to share with your kids. * Talk with your friends. Discuss ways of avoiding danger, how you might react in threatening situations and which streets are safer than others. * Tell your parents where you are going and when, and ask them to do the same. Call them if your plans change. Someone should know where you are at all times. * Always be alert and aware of what is around you. A robber or mugger targets those who are unaware of a threat and can be taken by surprise. Lack of awareness makes you vulnerable. * When you're with friends, don't get so absorbed in conversation that you become unaware of your surroundings and other people. * Walk with purpose. Look like you know where you're going. A mugger believes his victim is weaker, smaller, or vulnerable. * Whenever possible, travel in a group rather than alone. * Whenever possible walk on busy, well-lit streets. Don't walk in an isolated area. * Don't display large bills. Put all money out of sight before leaving a store. Don't carry more cash than you absolutely need. * When on the street keep smart phones and other electronics out of sight. They can attract interest from those who are looking for valuable items to steal. * Don't hesitate to ask or yell for help from other adults, or duck into stores or restaurants if you feel threatened or sense danger. * Never act "macho" when you are attacked. Give up what the attacker demands -- no possession is worth the risk of getting hurt. * If grabbed by the arm or wrist, the hair or otherwise, kick, stamp down on feet, bite, twist, punch, elbow and scream. Knowing a few basic self-defense tactics would be especially helpful. If you as a parent or guardian are knowledgeable in self-defense, teach your kids. A karate, taekwondo, or kung fu school might also offer this type of street training. * Be warned ahead of time to avoid strangers who ask you to help look for a pet, invite you to enter a car, vehicle or building to get candy, to see something, to talk, or meet a friend. If this happens you should run. If someone stops a car or van, opens the door and tries to talk to you, move away or run. * If someone approaches and asks for the time, asks directions or a question, keep your distance. Don't be distracted and be alert. This is a common tactic used by muggers to get close. By simply looking down at your watch or fumbling for a cell phone, you get distracted and can be attacked. Asking for the time is also a tactic to prompt you to take out your cell phone, so it can be grabbed or stolen. Thus, when asked a question by a stranger, keep your distance and keep looking at the person who approached you. Your best answer is "I don't know." If you have a watch and the other person sees it, and thus you feel you must answer, hold the watch out in front of you for the other person to see. * Prepare for a situation when someone, even a friend approaches you telling you that he or she has been sent for you. Create a password with your parent, guardian, or baby sitter to be used in emergency situations by another who has been asked to step in to help. * If you are mugged, tell your parents and anyone else who seems appropriate - your teacher, school official or your friends. Always report incidents of crime to the police. 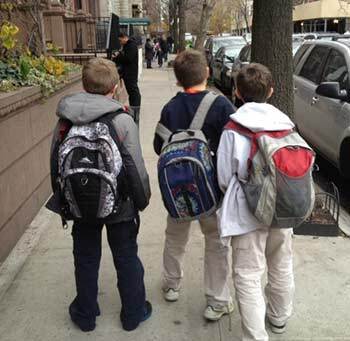 This article is based on advice circulated by the principal of my kids' school in NYC and was prompted by several incidents of robbery and mugging of middle school aged kids in the area.